| Source: Tim Cook's Twitter (@tim_cook) | Tim Cook standing in the manufacturing plant in Cincinnati. | Source: Tim Cook's Twitter (@tim_cook) | Tim Cook's Twitter feed light up after people began to explore this photo. Yes, you did in fact read that title correctly. 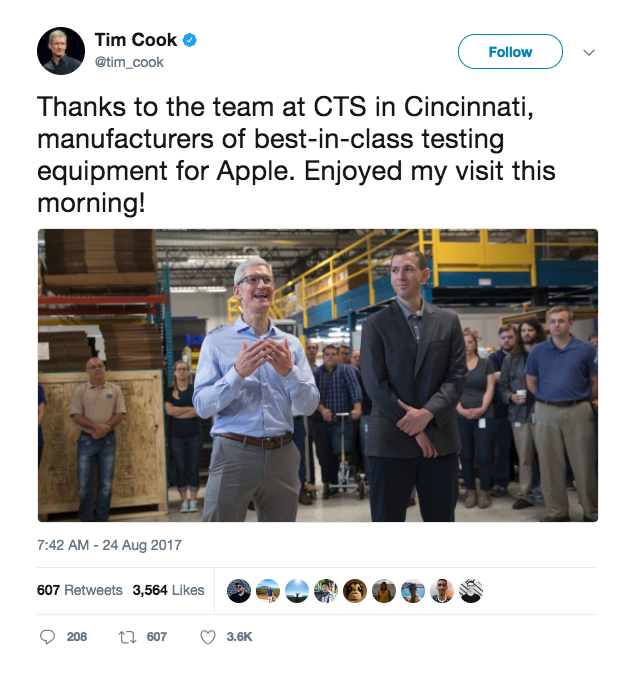 Last week, Tim Cook traveled heavily for work and on Thursday he paid a visit to a manufacturing plant in Cincinnati. Later that day he posted a photo from the visit on his Twitter account and the photo did not receive too much attention to begin with, but that quickly changed. Here’s what you need to know. Most people only viewed the photo as Tim being happy to be in Cincinnati meeting the team at this manufacturing plant. One person, however, began to look at the bulge in Tim’s pants. The bulge in his front right pocket to be exact. The outline appeared to suggest Tim was carrying a smartphone, no surprise there. What did surprise people, however, was the suggested size of the phone. It was too tall to be an iPhone 7 and too skinny to be an iPhone 7 Plus. Other than that, the only other thing anyone could take from this photo would be that, if Tim is in fact carrying an iPhone 8, it will look ridiculously big in your pocket. With all of the rumors this year, the community practically knows what the iPhone 8 or X or whatever it’ll be called is going to look like and the specs it will pack on the inside. It has been rumored that the reveal event for the new iPhone, Apple Watch 3, and the new Apple TV will be happening on the 12th of September, and the new phones are expected to go on sale on the 22nd. Yes, everyone is dying to get their hands on the new iPhone which is supposed to cost $999, by the way. That doesn’t mean we should start staring at the bulge in people’s pants, especially the bulge of the person who will be announcing the new phone. Are you excited for the iPhone 8? Do you plan on buying one? What is the feature you are most excited for? Let myself and other readers know below!